Foxit PDF Reader 5 has been released recently. The new Foxit PDF Reader 5 includes a lot of new enhancements and improvements. The most notable is the Ribbon UI and a Google Chrome like tabbed interface. Foxit Reader is generally known for its slim and sleek design and small size as compared to Adobe Reader. The speed of Foxit Reader is far better than Adobe Reader but Foxit Reader used to be lacking some great features that Adobe Reader was offering but not any more. The new version of Foxit Reader is incredibly small, blazing fast and highly secure. It includes many improvements over the previous version. Now Foxit Reader supports standard and XFA form filling with a better navigation layout of the document. The best part of Foxit Reader in its annotation tool. Now you can write your comments and annotations in the PDF files. Now it also includes a free spell checker for comments which will check the spellings in your annotations. While installing the reader, you can specify whether you want to install addins for Firefox, Opera, Safari and Chrome and other shell extensions. 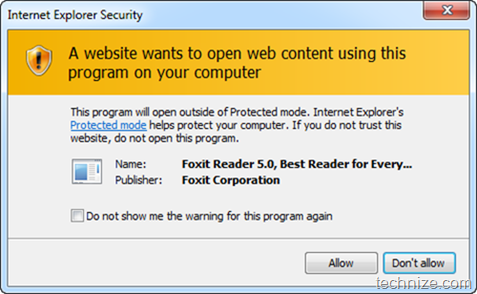 You’ll need to check the checkbox “Do not show me the warning for this program again" and then click on Allow otherwise it will always show the security warning whenever you try to open any PDF file in Internet Explorer. Another great feature of Foxit Reader is that free telephone support is available even for the free version of Foxit Reader. You only have to register for the support. You’ll get a registration option after installation. In my opinion Foxit Reader is a better choice than Adobe Reader starting from version 5 because of its speed and security. 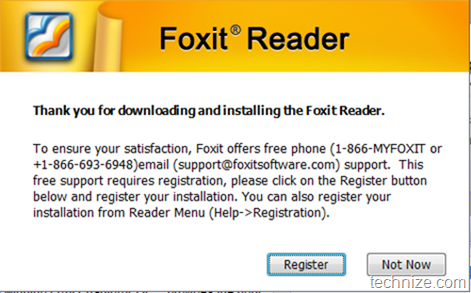 So it’s time to replace the bloated Adobe Reader with Foxit Reader. Foxit Reader is compatible with Windows XP, Windows Vista and Windows 7. It`s seems really atractive but i am using Adobe and i am okay with it. 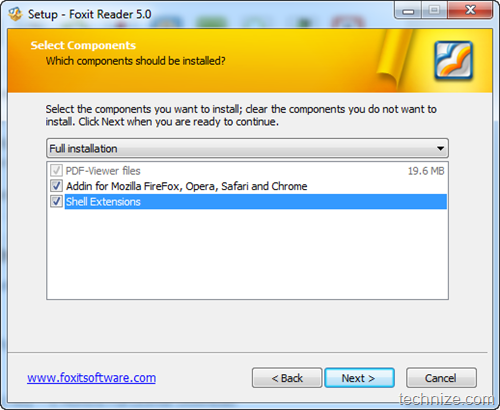 Is Foxit really better …..
Adobe reader was my choice for a PDF reader but it was heavy and bloated. With the release of Foxit Reader 5, it has become my default PDF reader on my production system.. you’ll definitely love it when you try for yourself ..